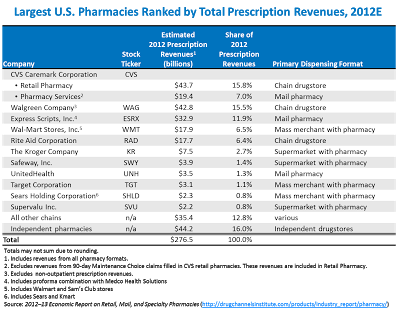 NOTE: For fresher data, see 2013’s Top Pharmacies by Rx Revenues: The Big Get Bigger. Next week, we'll be releasing the 2012-13 Economic Report on Retail, Mail, and Specialty Pharmacies. Here's a sneak peek at my list of top pharmacies, ranked by total prescription revenues. The exhibit below, one of 82 in my new report, shows estimated share of prescription revenues by company for calendar year 2012. The top five dispensing pharmacies—CVS Caremark, Walgreens, Express Scripts, Rite Aid, and Walmart—accounted for about 63% of U.S. prescription dispensing revenues in 2012. The degree of concentration is comparable to that of 2011, although market share consolidated from six to five pharmacies due to the Express Scripts/Medco Health Solutions merger. Walgreens also lost market share, as we discuss below. We estimate that total revenue growth of retail, mail, and specialty pharmacies slowed to 0.6% in 2012. Read on for the 2012 details. For a sneak peek at the updated and expanded 2012-13 report, check out the free Overview. Here’s Exhibit 7 from the new report. Click here to download this chart as a PDF file. Walgreen’s prescription revenues suffered due to its exit from the Express Scripts retail pharmacy network, on January 1, 2012. In mid-September 2012, Walgreen re-entered the network, although it is still excluded from the TRICARE network. Walgreen's sales loss was offset by acquisitions, new store openings, a stronger-than-expected seasonal flu season, and its re-entry into the Express Scripts networks for the last 15 weeks of the year. Through December, Walgreen has recaptured about 40% of the prescriptions from the Express Scripts dispute. At the end of 2012, Walgreen operated 8,061 drugstores, a net increase of 243 during the year. Rival pharmacies gained from Walgreen’s sales losses. Until September 2012, year-over-year sales declined by 10% to 15% at Walgreen’s pharmacies, while sales increased at the other chains. CVS’s retail pharmacies gained 6.5 million to 7 million new prescriptions from former Walgreen’s customers. It expects to retain 60% of these customers. Express Scripts completed its merger with Medco Health Solutions, creating the largest mail and specialty pharmacy. In 2011, Medco’s mail pharmacy was the third-largest U.S. pharmacy by revenue. However, Express Scripts’ share is less than the combination of the two independent companies, due to Medco’s contract losses, including Medco’s loss (and OptumRx’s gain) of UnitedHealth’s commercial business, effective January 2013. Walmart benefited from its aggressive participation in preferred network models, especially the Humana Walmart-Preferred Rx Plan in Medicare Part D. Walmart estimates that nearly 25% of its 2012 prescription volume derived from its participation in narrow networks, compared to less than 1% in 2009. In 2012, Rite Aid grew more quickly than Walgreen, but more slowly than CVS. Rite Aid’s same-store prescription revenue growth has historically lagged that of CVS retail and Walgreen. But in 2012, Rite Aid also benefited from Walgreen’s dispute with Express Scripts, gaining prescription volume that would have gone to Walgreen. This beneficial effect is diminishing as Walgreen re-enters the Express Scripts network. Many large companies operate with multiple dispensing formats, although the exhibit only lists the primary dispensing format for each company. The revenue figures are calendar year estimates, so they may not correspond to fiscal year reporting. 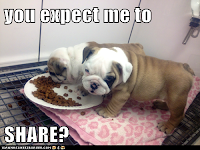 Market share in a particular geographic region or market can differ greatly from the national averages. The report discusses regional market share in the top 20 U.S. metropolitan markets, for specialty medications, and in the mail pharmacy segment. Note that total pharmacy industry revenues differ from previous reports due to IMS data restatements. I’ll tell you more when the report in launched next week. Stay tuned! P.S. Feel free to cite or link to these estimates. As a friendly reminder, please attribute the source properly. Great info! Are you going to publish a table about drugstore market share in regions of the country? I'm not planning to post to Drug Channels, but the new edition has market share by region for the top 4 chains plus more information on regional chains. In terms of Wal-Mart's 25% Rx volume coming from Preferred/Narrow Networks, did they say this publically? If so, it appears this trend will continue to gain momentum. In an on-the-record conversation, a very senior Walmart executive told me the volume figure. Who Paid For Prescription Drugs In 2011?